Offering you a complete choice of products which include brass sofa. 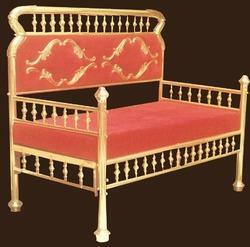 We are engaged in manufacturing a wide range of Brass sofa, which is renowned for their varied designs and patterns. We fabricate these tents using premium quality materials in accordance with the quality standards. These tents are immensely acknowledging due to their significant properties such as wind defiant, easy to install, sturdy construction and attractive.